Hubby and the kids are all big drinkers of water. I'm lucky that my two only really go for water and we take water bottles with us everywhere. I've been the only fly in the ointment, I find it difficult to drink more than a glass of water or two a day. It's not that I was particularly drinking anything else (although I do like a couple of coffees a day). I just didn't drink much at all and often forgot to drink, which sounds really silly now. I had a wake up call when I had to go to hospital with abdominal pain. They couldn't find anything wrong and suggested it could be IBS or something similar. Whilst there they assessed me and found I was dehydrated and it wasn't helping the situation. 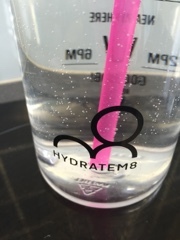 In fact not drinking enough water aggravates irritable bowel syndrome. 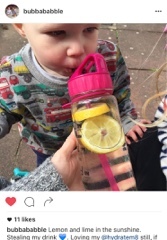 So I vowed to up my water intake and a few days later whilst scrolling through Instagram I found the hydratem8 bottles being used. I'm such a sheep that I was on the website and ordering one straight away. 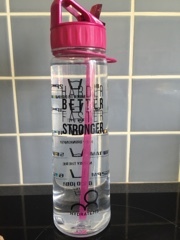 These bottles are brilliant because they are motivational bottles with a message one side, mine says HARDER BETTER FASTER STRONGER, you can choose from a couple of options. 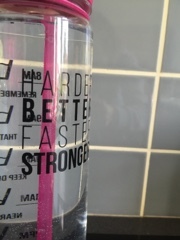 The other side has a rather nifty water gauge on it to help remind you that you should be drinking and by when, the time increments help you stay on track and then at lunch time you refill and start again. Easy to get to your 2ltrs in no time at all. 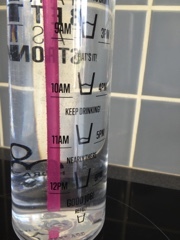 Rather than a 5 minute fad for me, my water intake has risen from a mere glass if I was lucky to at least 2 ltrs a day, every day for the last month. Wherever I go, people ask about the bottle and often order themselves one too. I feel lost if I leave the house without mine now, it's on a par with my phone. 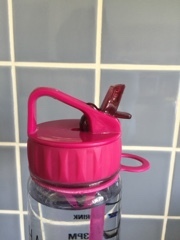 I love that it has a flip lid so there are no spills and a straw, I always hate having to swig from a bottle. Oh and they come in various colours but I chose pink cos I love a bit of hot pink in my life. 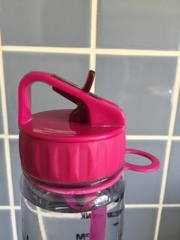 The kids often steal mine too and the website does bottles for children. As you can see in the photo, I sometimes mix it up and add fruit. I must admit I did think my skin would clear up as people told me it might but sadly it hasn't. I think that's down to hormones...oh well! I have noticed that I get a lot less tired now, if we have a nightmare night with one of the kids, I don't spend all day yawning and unable to cope. I'm still tired but not in a 'my head may explode way' so I've noticed it's more manageable. I get fewer headaches now, I've always been prone to them but now I don't very often wake up with a fuzzy head that won't clear. If I am struck down with one during the day, the more water I drink the easier it is to carry on through it. The best bit is that every day when it gets to 7pm and I've drunk 2ltrs I feel proud of myself. Then when I reach for another glass in the evening I feel almost smug.